As you move up and on, you will discover these education requirements are more gatekeeper than a dead end. They’re there to keep people out of the position you’re looking for. This may come as a shock to you. After all, education is a requirement. But it’s not. Not in the common sense. Employers and organizations are looking for people with a formal degree because getting a degree is a sign of commitment. Your following through and obtaining a college degree shows them you can stick with something, regardless of the difficulties you’ll encounter along the way. 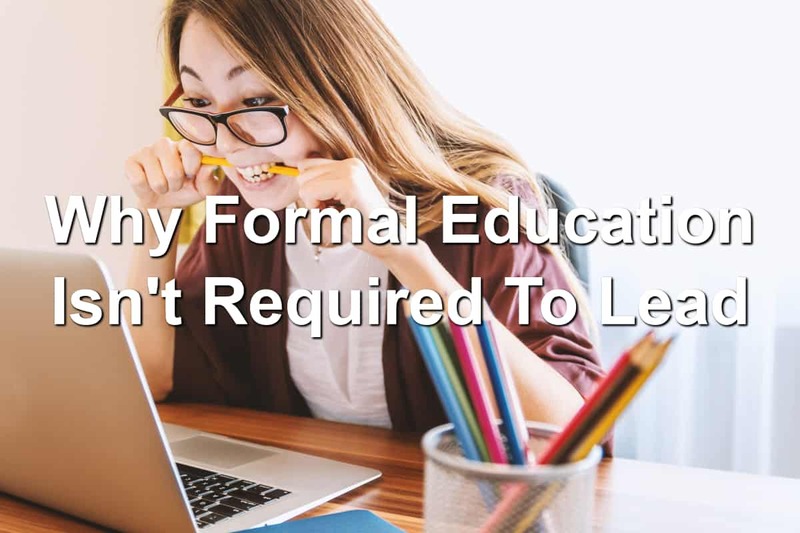 Formal education is only one way to show your potential employer or business partner that you have what it takes to lead well. There are many ways to show your experience and education without a degree. Your life experiences will provide you with much of the education you may need to succeed in business and life. You’ve experienced much and those experiences have taught you some hard life lessons. This is why people often say they went to the school of hard knocks for their education. They may have taken a long, hard road to gain the knowledge, wisdom, and experience they now bring to an organization. Do you feel you’ve learned plenty outside of school? Use this to your advantage when you’re struggling to show your true level of education. You learned about financial budgeting through a financial hardship that bankrupted you: Through this, you learned how to budget and manage money. You have first-hand experience in this area. You learned how to lead well through volunteering at your local church: Churches and local non-profits are always looking for someone to volunteer and help their organization. Maybe you spent time at your local church leading students or another ministry. Your time spent there could be the experience and education you use to lead well. You learned to navigate sticky personal situations through your large family: Do you remember the time you had to break up the fight between your drunk uncle Drew and uncle Bill? You used wisdom to navigate the sticky personal situation of two angry men. You helped dissolve the conflict and get them talking again. Most of your education for leadership will not come from the traditional classroom. Rather, your leadership education will come from the real world. Don’t feel like you’re uneducated because you don’t have a 4-year degree from Harvard or Princeton or the local college. There’s nothing wrong with those degrees. But they’re also not the only education you will get. Be ready to show your self-taught education and how this education will benefit you in the position you’re in or going for. You might be surprised just how smart you are.